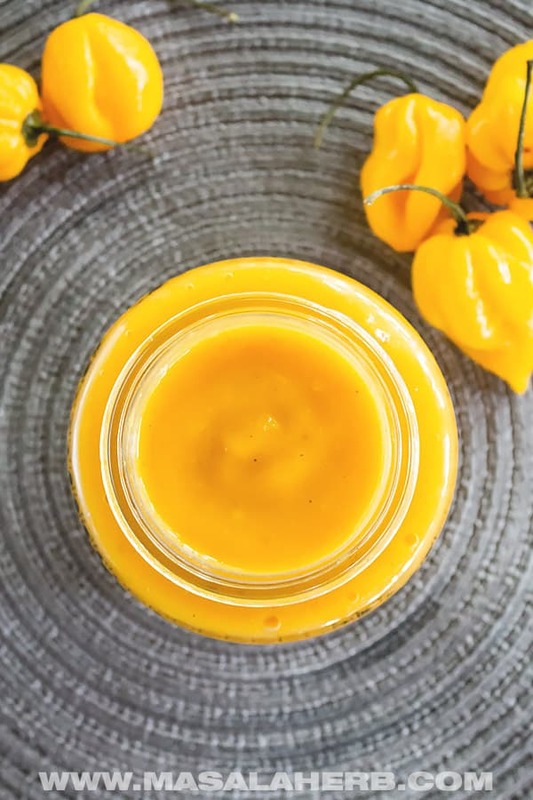 Easy Hot Mango Habanero Sauce with real fresh habanero chili peppers and Mango fruit. This sauce is irresistibly hot and sweet! I get the compulsion to make chicken wings or fried chicken just so that I can dip my warm crispy chicken in this amazing hot sauce. Made with natural ingredients. This is part of my homemade hot sauce series which also includes Thai sweet chili sauce. The habanero mango hot sauce is prepared with real whole ingredients, you will need fresh Mangoes and habanero chilis. 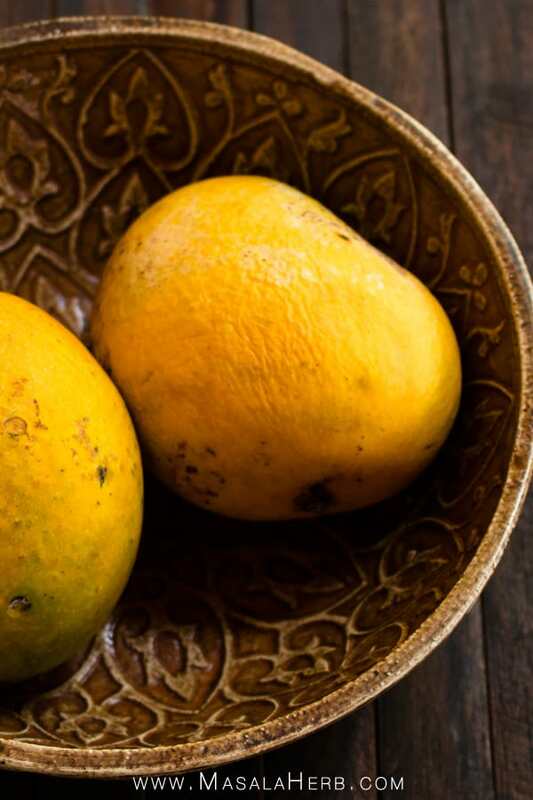 For the Mangoes pick a Mango variety that is super sweet. The sweeter the better and I love using deep orange mangoes because the color of the sauce turns out super striking. People are going to dip their chicken wings again and again into the orange sauce while loosing happily a tear due to the heat! 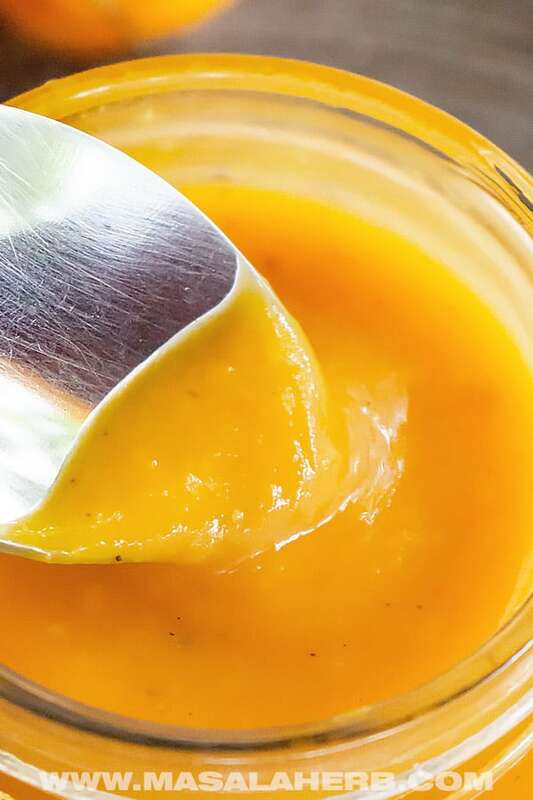 Use Mangoes which are ripe but never ever use mangoes which are getting spoiled and mashy because these can turn your sauce faster bad and that would beat the purpose of storing this sauce for a prolonged time frame. The same rule applies for Mango Jam and similar condiments which are supposed to last for at least 1 year. If you don’t get fresh Mangoes, then you have the option of using Mango Pulp. I usually make a batch of freezer friendly Mango Pulp and another batch of cut Mango pieces, which I store in ziplock bags. That I use in the course of a few months for recipes such as this hot sauce. For the Peppers, you need to use whole fresh Habaneros. Those are some of the hottest chili peppers out there! I use the pretty yellow habaneros and I barely use three of those hot babies because they are seriously naughty. Usually you would use gloves to handle habaneros because they can irritate your skin if you have little cuts or just imagine if you touch your eyes by accident (which you shouldn’t do anyway), yet I don’t even bother to open up a habanero for this hot sauce because they are ground to a paste. You can save yourself trouble that way. I tried to make this sauce with other peppers including African Bird eye chilis and Thai Bird eye chilis. It never turned out that strikingly good. 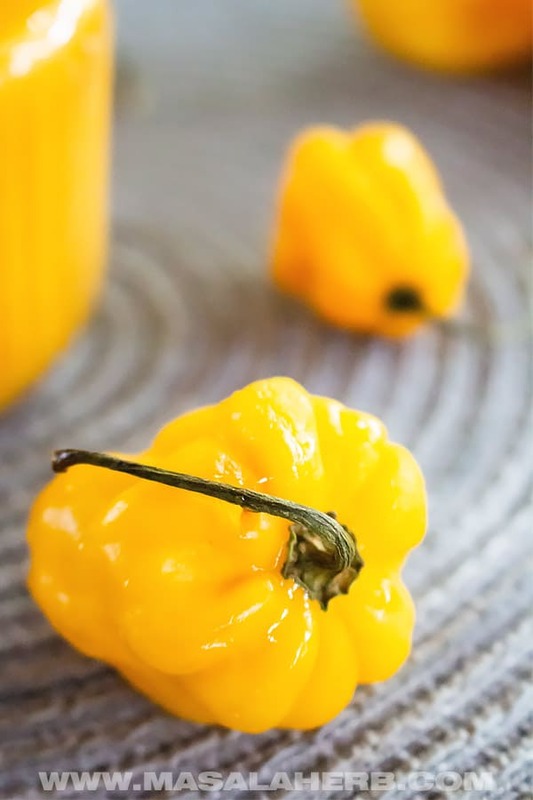 However, I think you can substitute the habaneros here with scotch bonnets which are a bit less hot but resemble the Caribbean style peppers the most. FYI I haven’t had a chance to try this sauce with scotch bonnets. The vinegar you choose for this sauce will determine the pungent flavor of the hot sauce. This is a taste preference I would say, however, I do believe that some vinegar is more suitable than others. Vinegar has an important part in this hot sauce. It makes sure that the sauce can be stored for a prolonged period of time as it kills germs. Vinegar preserves the Mango habanero hot sauce. White Vine Vinegar might just be the best choice for this hot sauce if you want your vinegar to remain in the background as a flavor profile. Often while I tend to use rice wine vinegar for sauces because it’s mild but it might give you a feeling as if there isn’t much vinegar in place in this sauce. So if you want it less pungent, than use rice vinegar. Another option is to use apple cider vinegar. This one is not everyone’s favorite but I am addicted to the result of my mango habanero sauce with apple cider vinegar. I also love using coconut vinegar but a strong homemade version which adds so much flavor and turns the hot sauce all the hotter. Coconut vinegar works well with the mango as well. Garlic – Ginger’s best friend. Helps to preserve as well and compliments the ginger. How hot is this sauce? Well, let’s say this sauce is not for sensible taste buds out there. It’s a super hot sauce thanks to the habaneros and the sweet Mango which kind of enhances the sauce all the more with its natural sweetness. This Mango habanero hot sauce is very spicy. You will mostly use 1-2 Tablespoons with each meal as a dipping sauce or in foods such as soups because it takes a punch. That means the whole bottle/jar will last you an eternity! 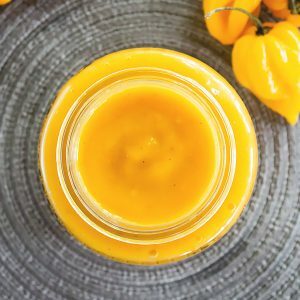 How to make Mango Habanero Sauce at home? 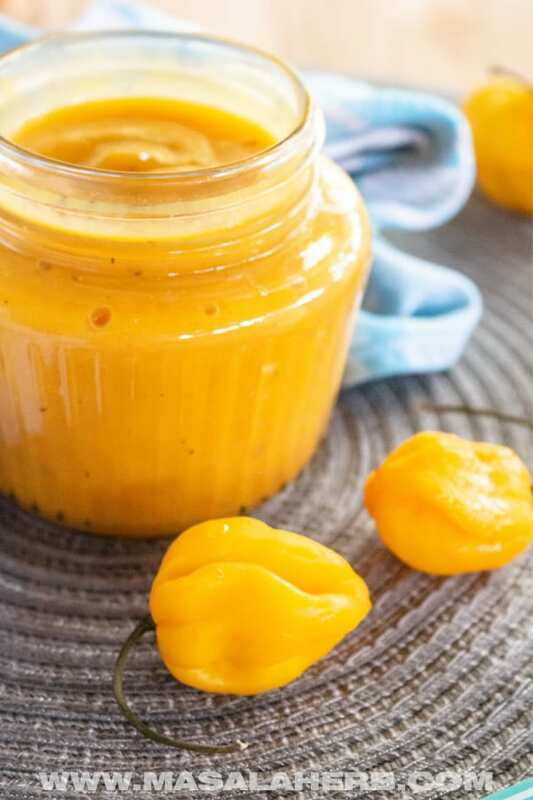 To prepare the mango habanero sauce you will need a good blender such as a Vitamix so that the mango, habaneros, garlic, and ginger are ground properly (I hate bits in this hot sauce). I wouldn’t use a hand blender because it’s not that powerful compared to a good blender and the chili is hot so you don’t want parts accidentally flying around. Also the moment you blend those chilis, you can make sure that you will be able to smell them. My eyes did start to itch when I opened the jar after the blending process. Once all ingredients are smooth, you transfer the paste into a saucepan and add the remaining ingredients. I love the non-stick PFOA-free T-Fal sauce pan. My mum has one for 20 years now and it never got scratched or damaged. Definitely a quality product worth acquiring. The sauce won’t stick on and the flavors stay pure. The sauce needs to be heated so to kill all the germs because you want the hot sauce to remain for a longer period of time. How to store the habanero mango hot sauce? You can store your DIY hot sauce in glass sauce bottles or simply in jars, like the ones you use to preserve jams. However, you must be clean! That means you need to wash out your bottles or jars, scrub them if necessary and sterilize the jars in a cooking hot water or in the oven so that all the germs die out. If you do that, you will extend the shelf life of your hot sauce! Super hot mango habanero sauce with whole fresh ingredients. This sauce will bring you tears of happiness! Dip your fried chicken into the hot sauce or use a tablespoon in your lentil soup, make it and enjoy it the way you like it! Try to use whole fresh mangoes or mango pulp. For the vinegar take your pick. See my suggestions in the post under the ingredients section. Into a Blender Jar, add the mango, whole habanero peppers, ginger, garlic, and water. Keep a saucepan ready and transfer to paste to the pan. Heat up the pan with the content. Keep on low heat. Add the Vinegar, salt, and pepper. Mix the content well and heat up gradually so that the sauce thickens. Cook until the sauce bubbles on low heat. Take from heat and let cool. Add the lime Juice at the end and mix in well. Let the sauce cool a little more for 5 minutes and then bottle up. Please use only clean sterilized bottles or jars. Dear Reader, how are you planning to enjoy your mango habanero sauce? This is an amazing sauce! And I especially love the list of other sauces at the bottom. I love, love, love sauces!! 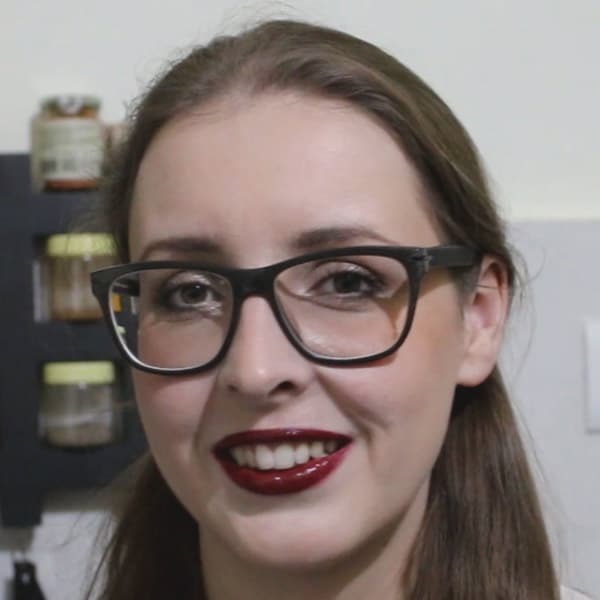 Hi, this may be interesting you: Super Hot Mango Habanero Sauce Recipe [DIY]!